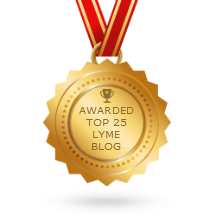 We’re thrilled to announce our inclusion in Feedspot’s top 25 Lyme blogs at number 14. So many fantastic global publications are on the list such as Lymedisease.org, CanLyme and Global Lyme Alliance. Our goal for the blog is to create quality posts about Lyme disease from a patient perspective. To help inform and support the UK Lyme disease community. Without the vibrant and passionate community behind us we wouldn’t be able to do what we do. We view this Top Lyme Disease Blog award as a marker for all the hard work our team puts in and all the wonderful help we get from the community. We also run a lively online support group, act as a directory for local groups, and represent patients in political discussions and at conferences. As always, if you’d like to contribute something to the website and blog, please don’t hesitate to get in touch with us. Our email is admin@lymediseaseuk.com or you can use our contact form. There are also many other ways you can help such as by joining our growing team or donating to our running costs. Check out the other entries on the list for a diverse range of Lyme related blogs.